b) The decorative roof (skirt roof) to give the building a Chinese Look, and are built 4-7 feet higher than the flat roof. If the intention is to fixed the rain leaks, all the fix can be done by simply fix the flat roof ( per its blue prints). 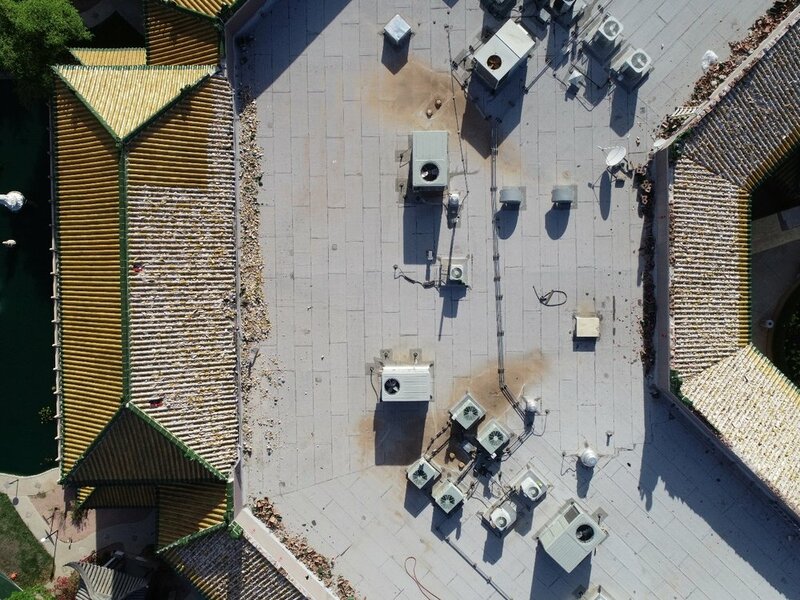 As for the certain areas of the flat roof that is under the decorative roof, the building was designed and constructed to include a 4-7 feet Knee wall supporting the decorative Chinese roof, to allow all repair on the flat roof under the Chinese roof. 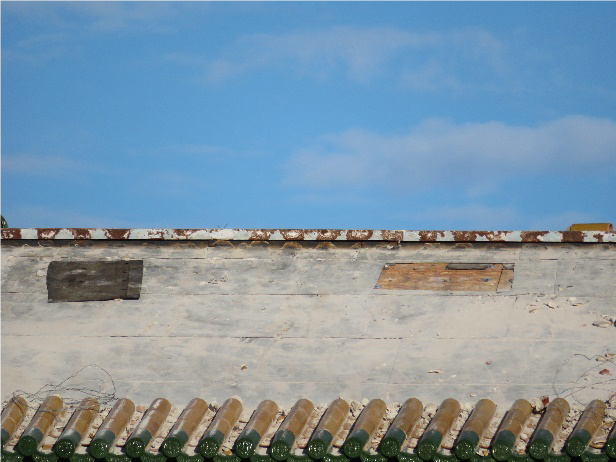 The Center’s double roof system would never require any fixing of the rain leak on top of the decorative Chinese roof. 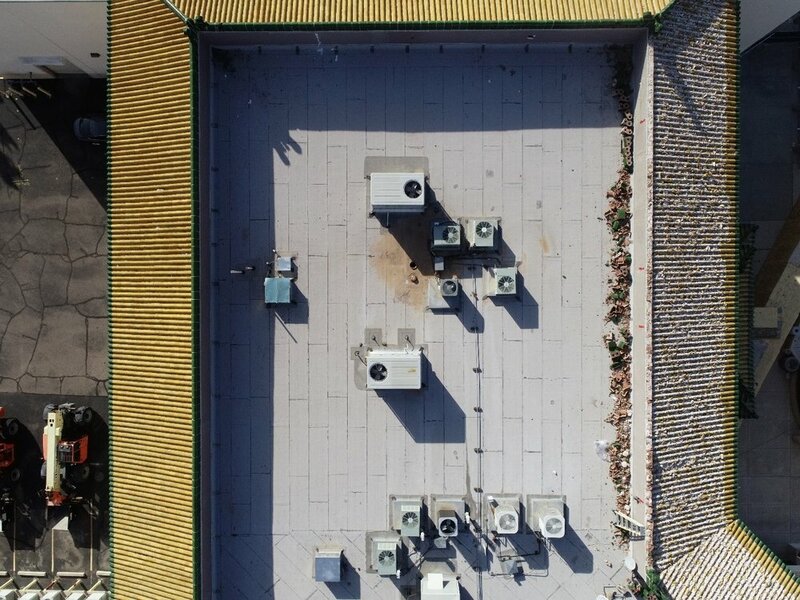 The leak can be fixed easily by enhance the floor of the flat roof inside the decorative roof attics, or enhance the decorative roof from the behind inside roof of the Chinese roof by entering the 4-7 knee wall from the entrance on top of the flat roof. 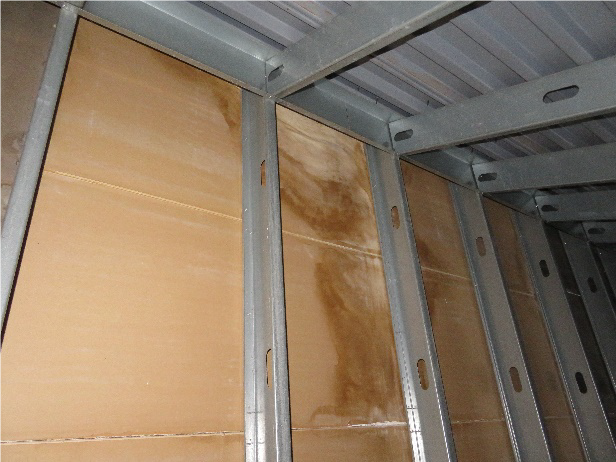 Figure 17: Exemplar photograph of moisture intrusion at the top of a knee wall as observed from the interior of the attic space (alternate view of Figure 10). 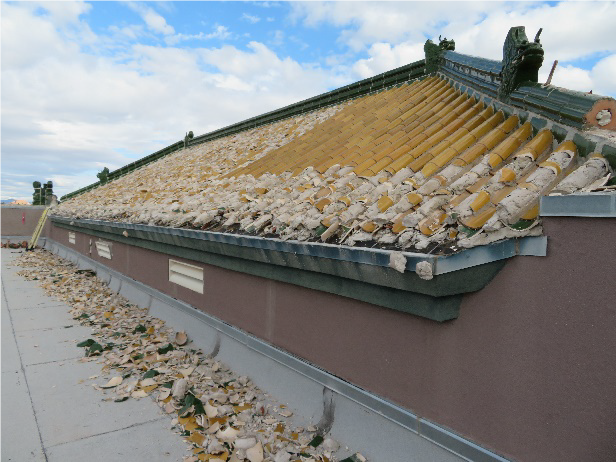 To eliminate over 14,000 sf of the decorative, and hard to find Chinese glazed clay tile, without taking any actions to preserve a single piece, cannot be justified as to fix the leak. 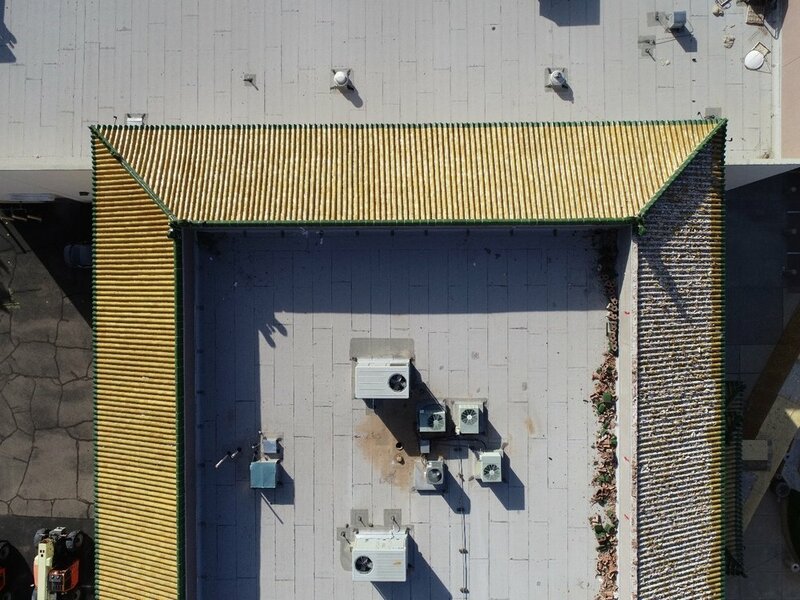 Such action is costing hundreds of thousands of dollars, while the correct way to fix the roof, and results forever the loss of its original decorative roof, while the simple fix could be easily accomplished as described above. b) To demolish over 14, 000 sf of the decorative and hard to find Chinese Glazed clay tile, in a two hours, by 40 demolishing workers, right before a heavy rain, and left the roof open without any protection from additional two rains from Oct. 13- Oct 27, including demolishing the roof twice before the heavy rains and during the rain, cannot be justified as to fix the leak. 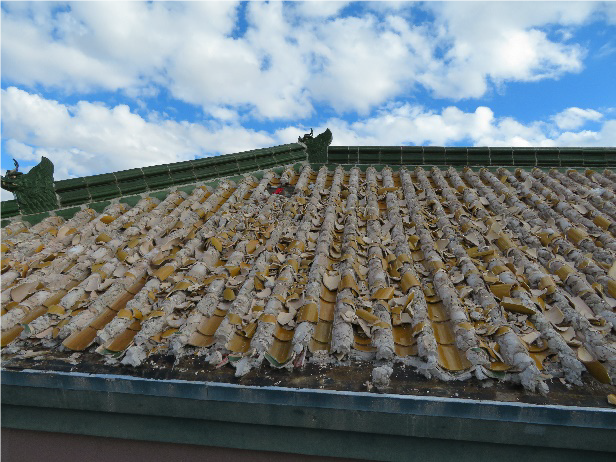 C) To demolish over 14,000 sf of the roof tile, without even have confirmed the identified the leaking points from any roofer, is not the act of repair the leak, unless is to create a total damage and eliminating the Chinese look, as the roofing contract ( from the roofer) specified. 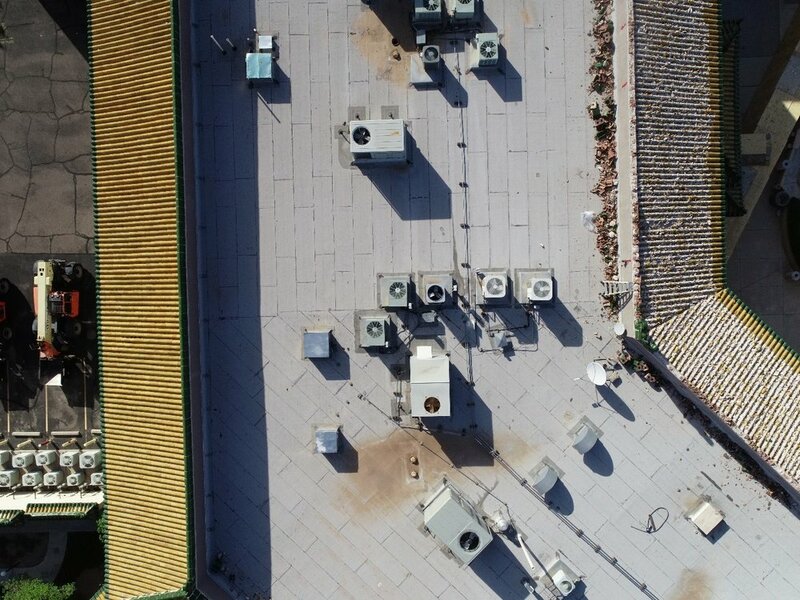 d) The expert identified the leaking points on the flat roof, by the air-condition units was still not fixed by the roofer, shows the intend was never to fix the leak by to create more leak to mislead the court and to justify its actions. a) 668 North failed to present to the court an expert witness, when court asked. John McCurry’s testify should not be counted, and he admitted that he had no plan on fixing the leak, and had no photos to show the leak spot, and personally not taken any leak photos before taking the demolishing on October 13.
b) 668 North has no expert to the court. Court gave 668 a chance to present an expert witness, but 668 could not find any expert will lie to them. John McCurry, is the sales manager, a friend of Tedesco, and is the person who created the 14,000sf of roof damage in 2 hours before the rain, he is determined to do everything to lie to the court to justify his action. c) Court should not use the unjustified afterword evidence ( photos taken by 668 North lawyer on Oct, 23,) to confirm the need for the rain leak. 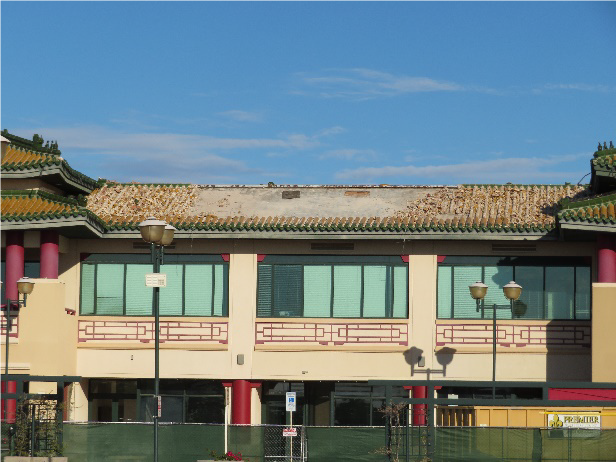 668 North failed to present court any evidence of the rain leaks inside the Chinese Decorative roof, and even the roofing company confirmed that they have no photo and documents to confirm any leak before they destroyed the 14,000 sf of the Chinese tile. However, in the hearing, court allowed Payne ( 668 Lawyer) to present as evidence of the leak) 58 photos that he admits that taken by him on October 23rd, after the rain, inside the attics. 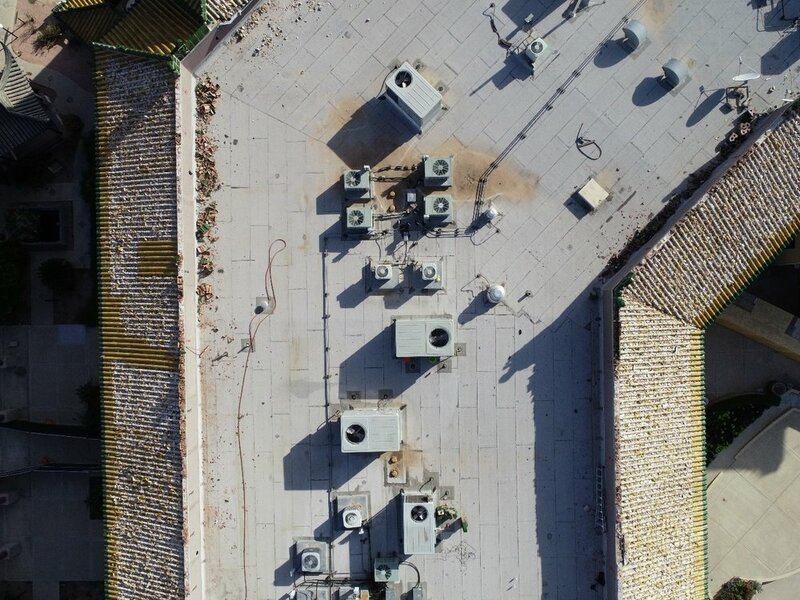 Those photos are not supposed to be admitted by the court, as it was taken 10 days after the damage to the roof, and also the CJ expert re-inspected those spots and clearly told the court and confirmed those are not leaks, and there is an isolated spot of the leak by can be very well the cause of the Oct. 13 damage to the roof. Figure 16: Exemplar photograph of moisture intrusion at the top of a knee wall as observed from the interior of the attic space. Figure 19: Exemplar photograph of the decorative jade colored ceramic wall caps destroyed during removal. Figure 20: Exemplar photograph of the decorative jade colored ceramic wall caps destroyed during removal. • Defendant 668 North’s methods of clay roof tile removal are unconventional. 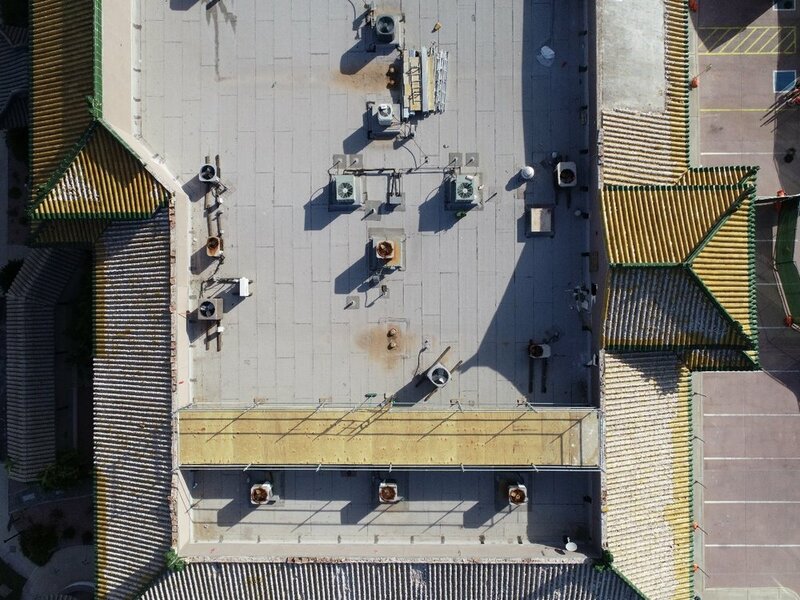 They damaged large areas of the clay roof tile caps and then returned to remove the pans and debris at a later date. 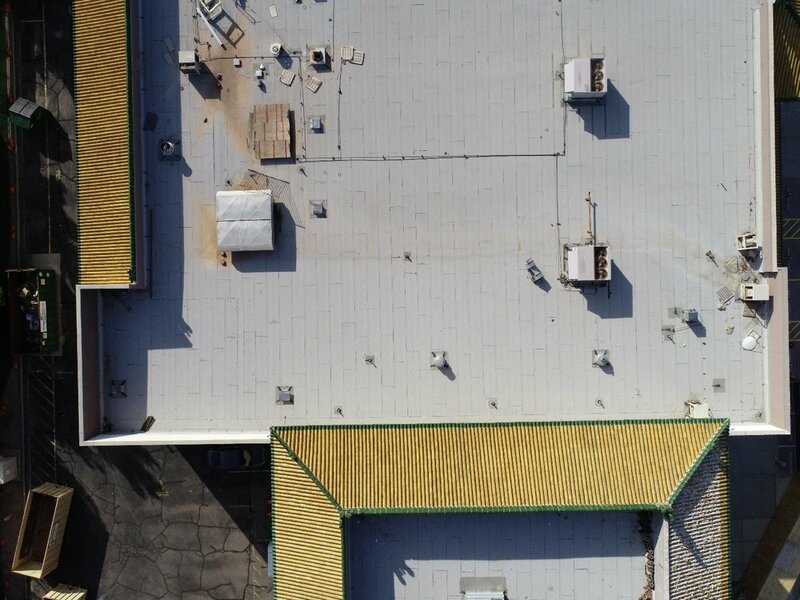 This is not only unconventional, it is not cost effective and exposed the roof underlayment system installed beneath the roof tiles to expected rain and inclement weather. Figure 8 Illustrates the areas where Defendant 668 demolished the cap tiles (orange highlight) and the area where they removed the pan tiles and remaining mortar down to the underlying roof membrane (blue highlight). The dark blue square within the blue highlighted box indicates the area where Defendant 668 cut through the roof membrane installed beneath the clay roof tiles. The black x indicates the single location where Shelton observed evidence of moisture in the attic space potentially attributable to the clay roof tiles. 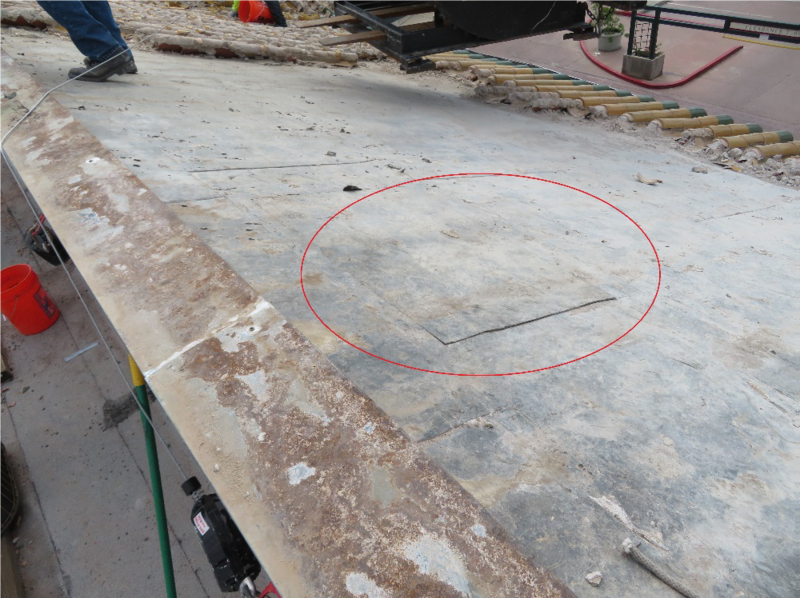 Figure 10: Close up view of Defendant 668 North's demolition efforts illustrating the cut-out area of the roofing underlayment left exposed overnight. 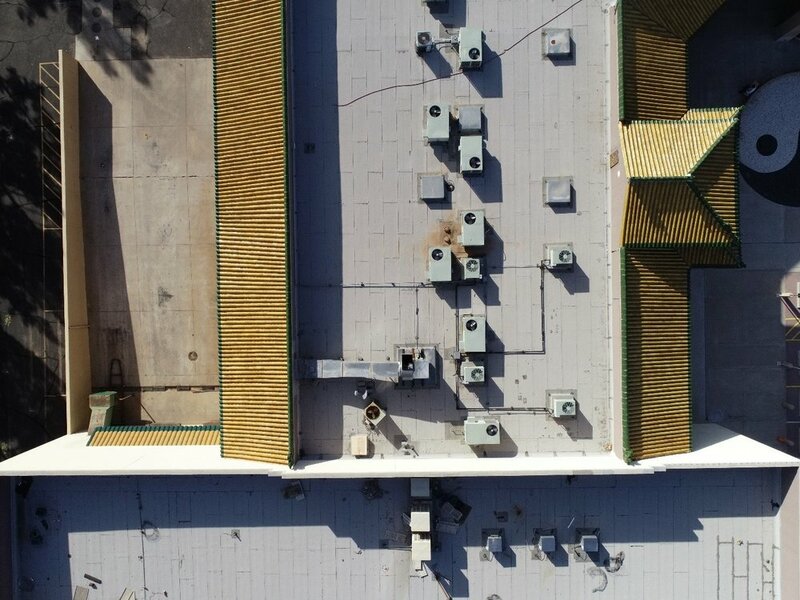 Figure 9: Overview of Defendant 668 North’s Clay Roof Tile demolition down to the roofing underlayment on Monday, October 15, 2018. 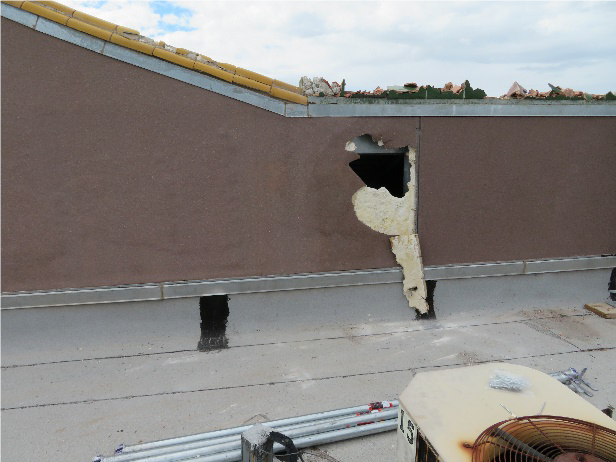 Figure 11: Image of cut out through Built-up roofing installed beneath the clay roof tiles. 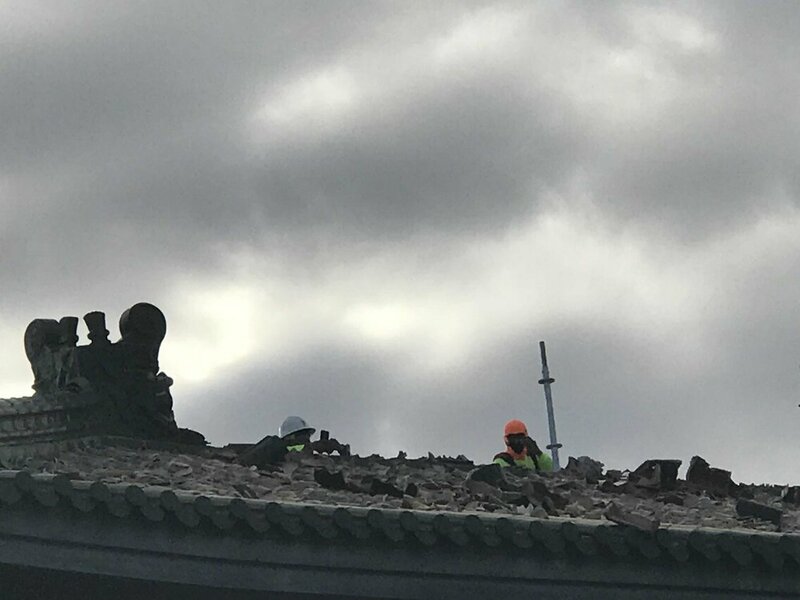 This is the same section of roofing membrane that Defendant 668 cut out and removed the previous day as illustrated in Figures 3 & 4.
a) The Chinese roof is a decorative roof, and the roof has at least 100 year life, not as John McCurry said at the end of its life. b) The Center roof leak showed no serious need for the emergency leak both from inside the building to the outside building. There was clear sign and spot on the flat roof air conditional equipment area of openings, that can be easily covered even by beer cans, to stop the leak, there are man-made holes on the Knee wall that is bigger than head of the man, that should be covered but were left open. Those are the key areas of the waters inside the building ceilings, and inside the attics under the Chinese roof. c) The garage leak has nothing to do with the Chinese roof or any roof, garage is separate from the building. d) The spots inside the Chinese roof, on the steel bar, are the old spots from these material, either before the construction or from the transportation. Those are not rain leak spots at all. Figure 22: Overview of the observation hole adjacent to the location where Shelton observed evidence of the one site specific leak at the clay roof tiles. 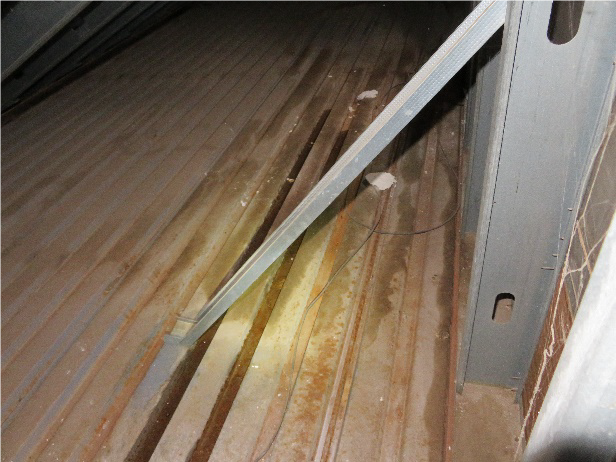 Figure 23: Moisture observed on the metal decking floor in the attic space indicating a possible leak from the damaged area of clay roof tiles above. e) Roofers since October 13 to when he inspected on Oct 16, and October 27, did nothing to repair any open spots on the flat roof at all, if the intention is to fix the leak. 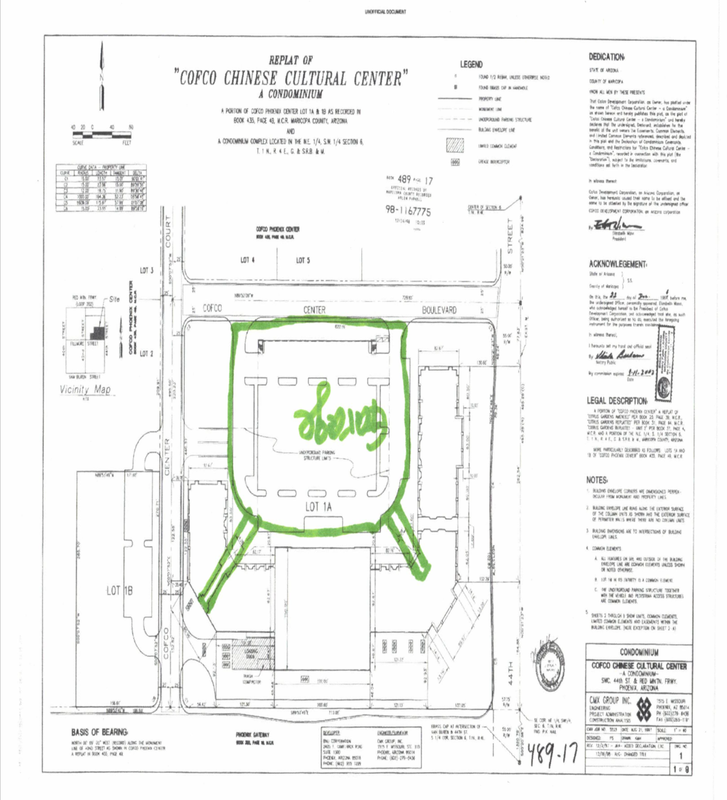 CJ design lawyer presented to the court contract between the southwest roofing and the 668 North LLC. The contract clearing showed the work was to demolish the roof. The contract even protect the southwest roofing of any legal liabilities from such demolishing the roof. a) In the contract, no words specify the need to fix the leak. All is about to demolish the roof. 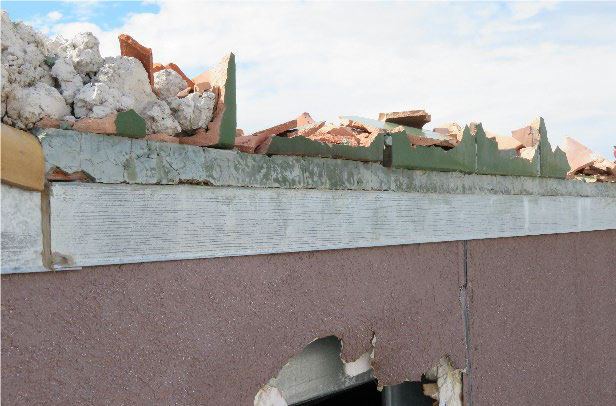 b) In the contract, it specified the potential legal liability from the demolishing, and confirmed that southwest roofing company would be spared from such liability. and to stop the lies of the 668 North, and stop the obvious contempt to the court order. Attached is the Judge Pamela Gates’s unfair ruling on Phoenix Chinese Cultural Center roof damage.